The weather was so grim that my parents really worried about us cycling and camping in the cold, even though we kept telling them that it’s our decision to travel this way and that we enjoy it! Even so, they very kindly treated us to another couple of days in the apartment they’d rented so we’d be sheltered from the elements. Of course, before their plane had even reached Gatwick, the skies in Athens had cleared and we had a couple of days of glorious sunshine. I’m sure they appreciated the What’s App photos of us walking on the beach and swimming. Regular readers might remember our extended stay in Bishkek, Kyrgyzstan, waiting for visas last year. During that time we spend a lot of time hanging out with Annie and Paddy, who are cycling a tandem back to the UK from South East Asia (2londoners1bike.com). They left Bishkek a couple of weeks before us and we’ve been following a similar route ever since. 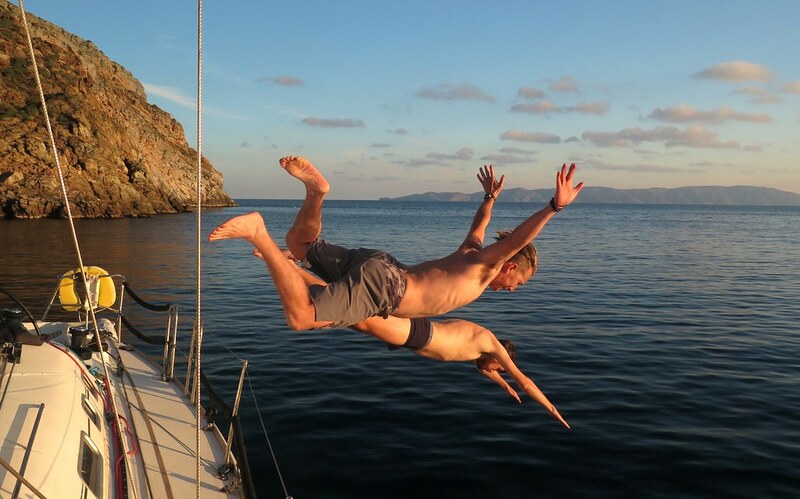 We had loosely planned to meet again in Greece, where they are spending 6 weeks on Paddy’s Dad’s boat, but we really didn’t know if the timings would work out. 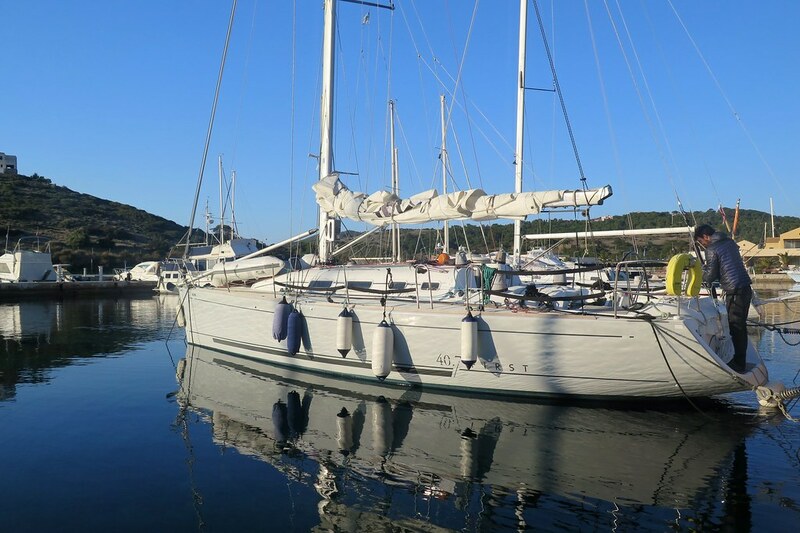 Conveniently, it turned out they’d just arrived back from a few weeks back in the UK and were on the yacht Encore, moored just a short cycle down the road from us, at Lavrio Marina. 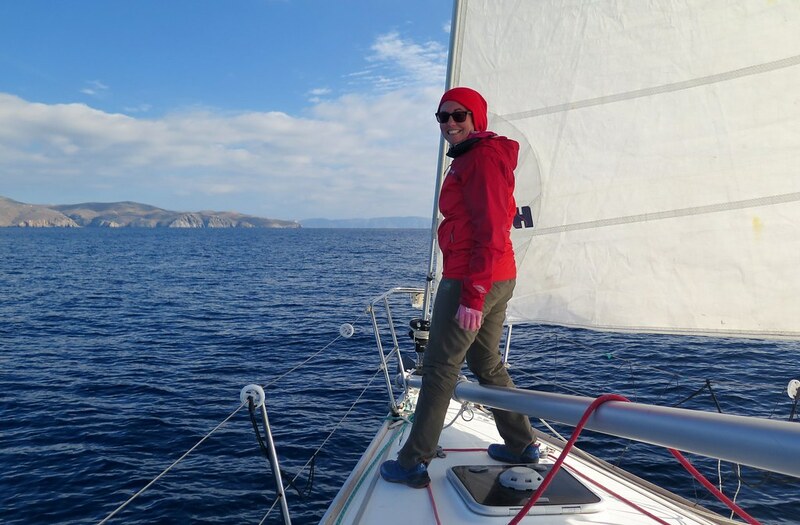 Over a few beers and gin or two, we hatched a rough plan to make the most of some nicer weather and good winds to sail around some of the closer Cyclades Islands. 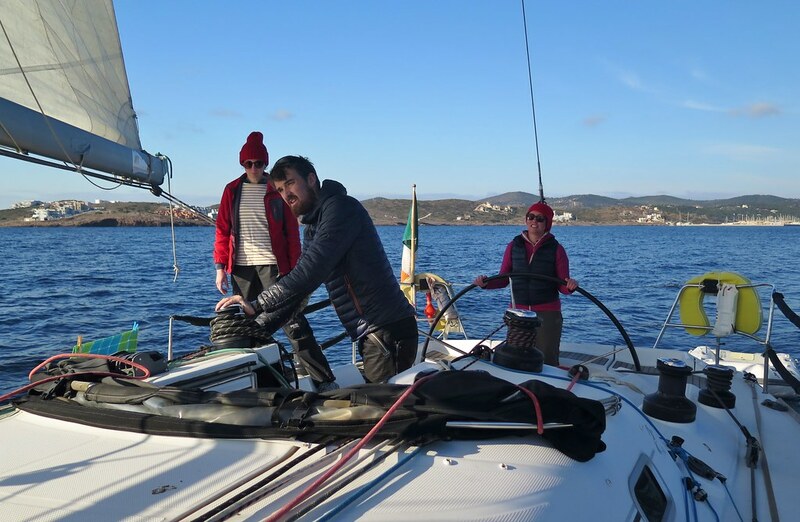 We spent a day in the marina getting the boat set up and loading up on supplies for the coming days, then set off down towards Kea. 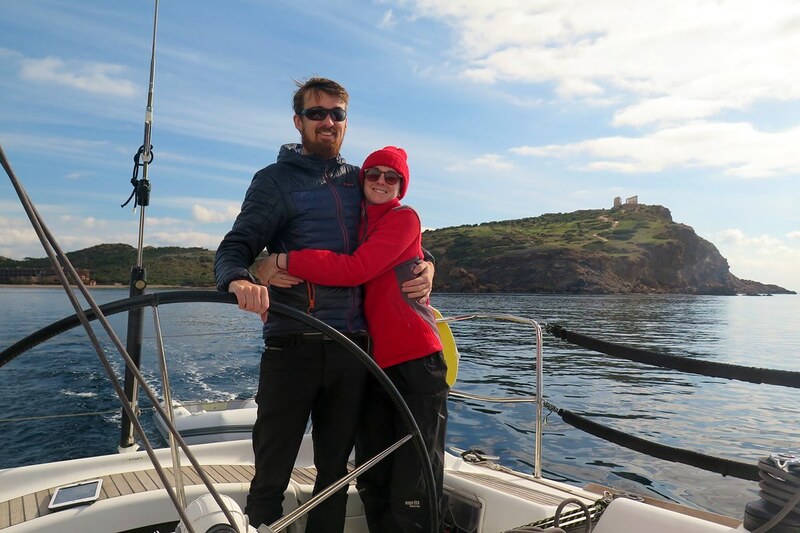 Clare and I have done a little bit of sailing, but not much. 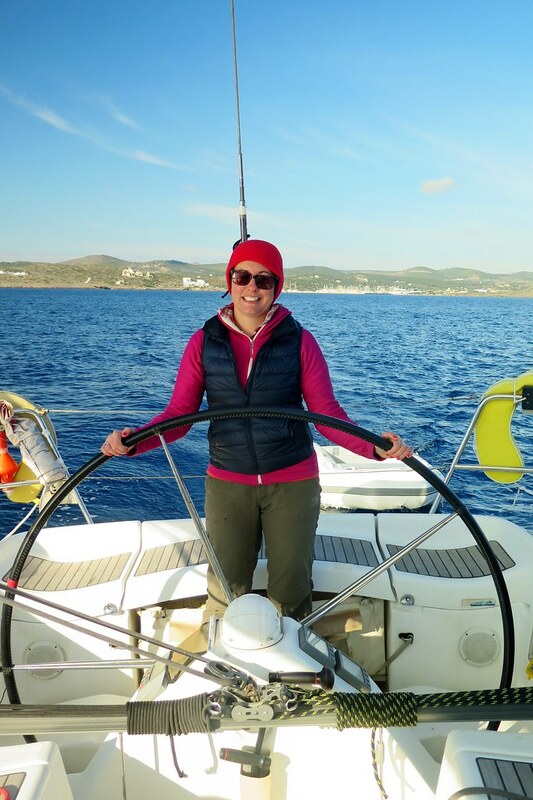 Paddy grew up sailing boats off all kinds and Annie has spent a lot of time sailing in the Greek islands with him, so they were (literally) showing us the ropes to start off with. 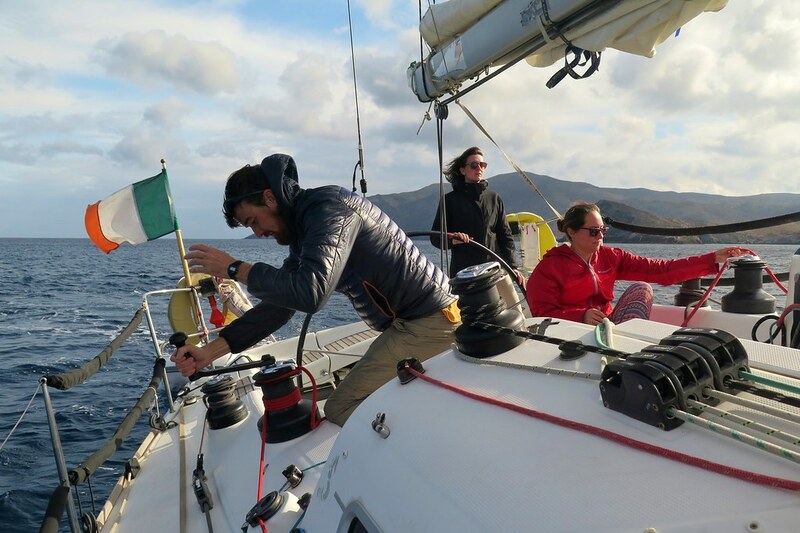 I think we picked up the basics pretty quickly and made useful crew members, winching, steering and making tea. 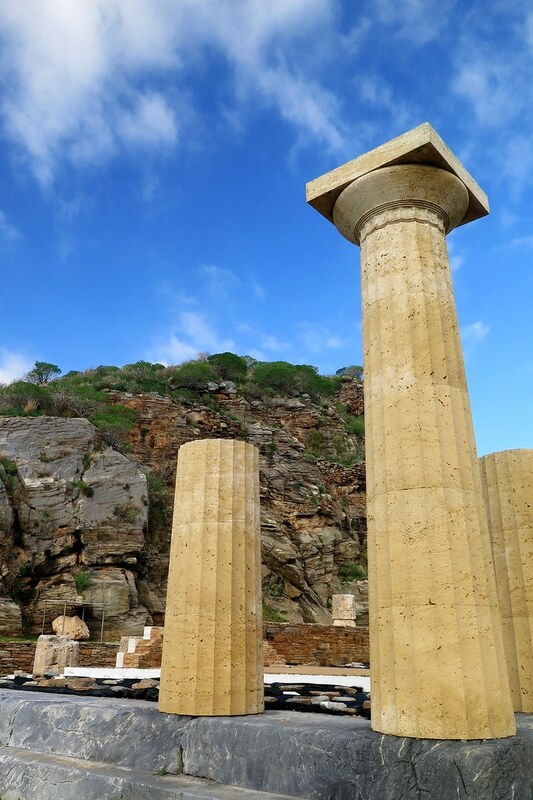 On the way around to Kea, we went past the Temple of Poseidon, getting a different view of it from the sea, and in the sunshine. (More photos What’s Apped to my parents!) 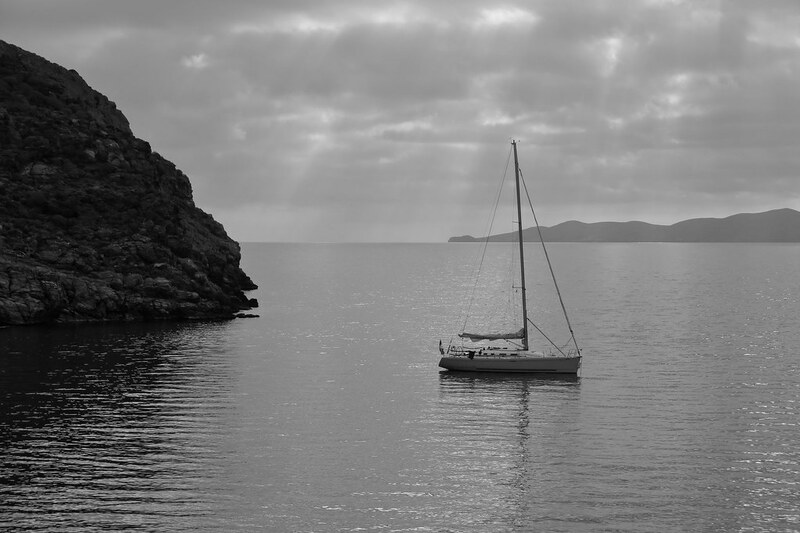 A fairly gentle sail in light winds took us over to a sheltered bay on the south east side of Kea. 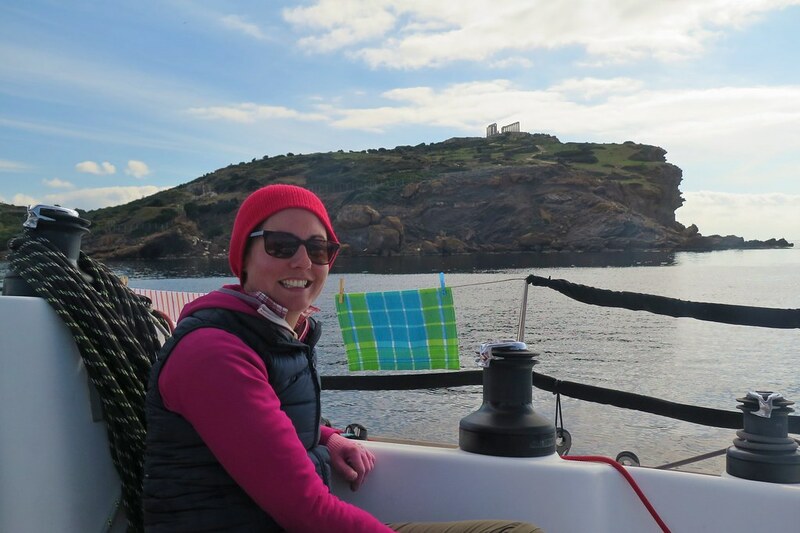 On the way, Annie spotted a couple of dolphins close to the boat which had us all peering over the railings hoping to see more. Unfortunately they didn’t reappear though. 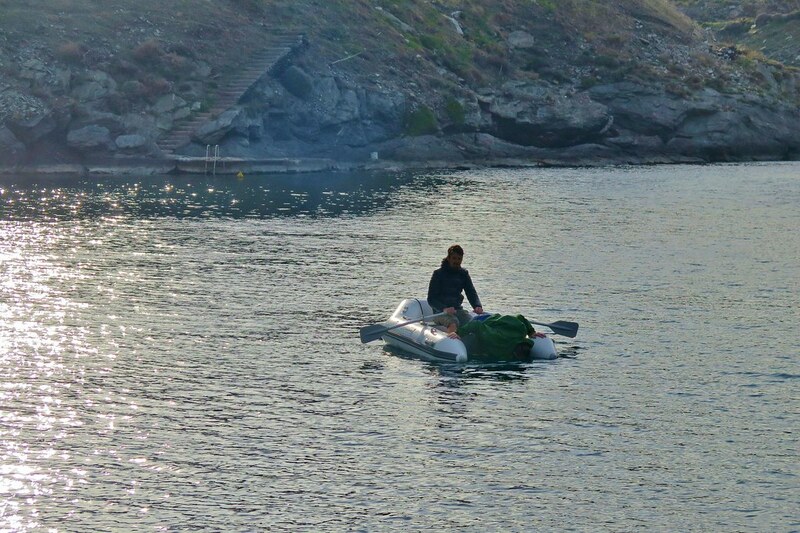 Once we’d arrived and dropped anchor, the sun was still shining and I was keen for a swim. I don’t think Paddy was quite so keen, but peer pressure got the better of him. The water is definitely colder up here than it was further south, but it’s so beautifully clear around these islands that it’s hard not to fancy a dip. 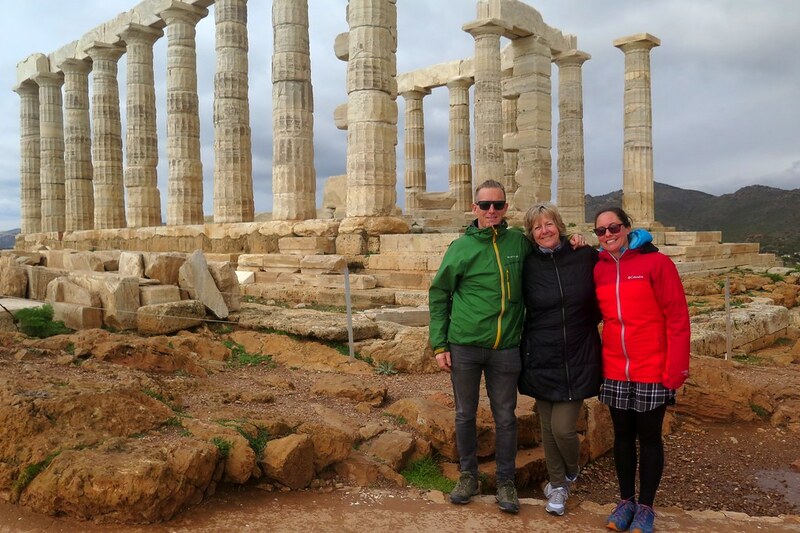 We went ashore the next morning for a look around the remains of an old Greek town, complete with amphitheatre and marble columns (the columns looked newly restored and quite out of place!) 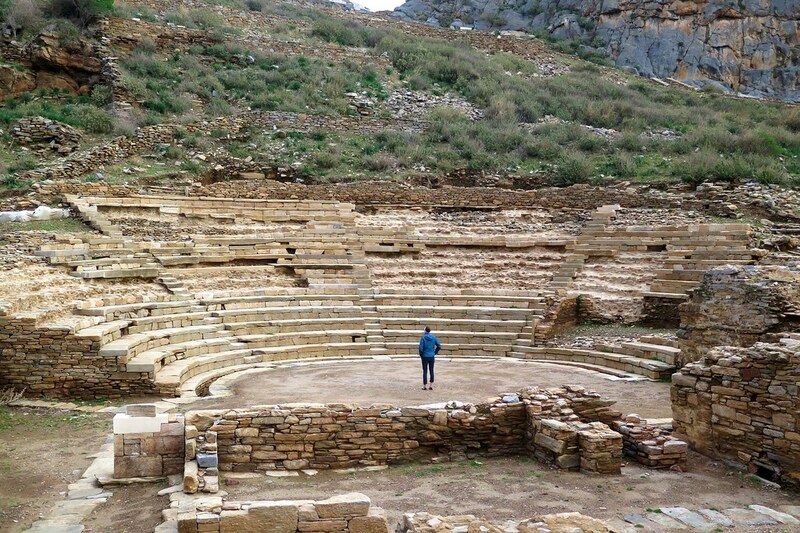 It was nice to wander around the place which, apart from us, was completely deserted. In the summer these bays are usually busy with yachts, but everywhere we stopped we were the only boat. 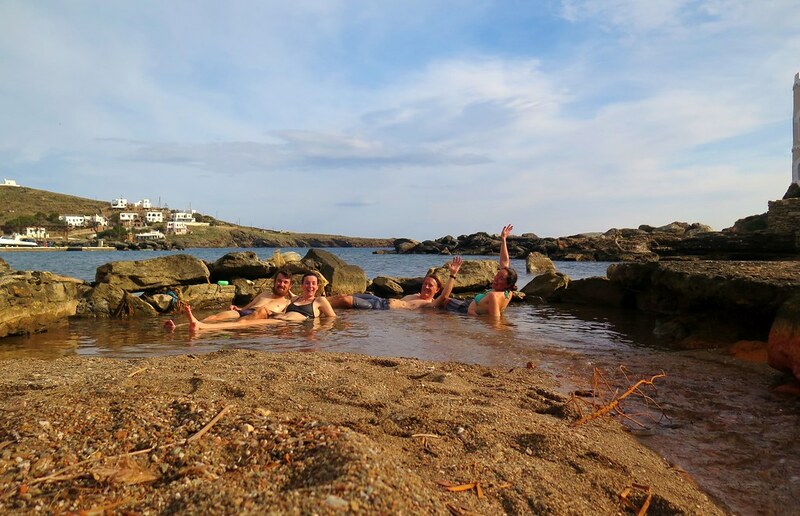 Clare, Paddy and Annie took the easy way back from the beach, opting to take the dinghy but I couldn’t resist and swam back to Encore to get the kettle on. 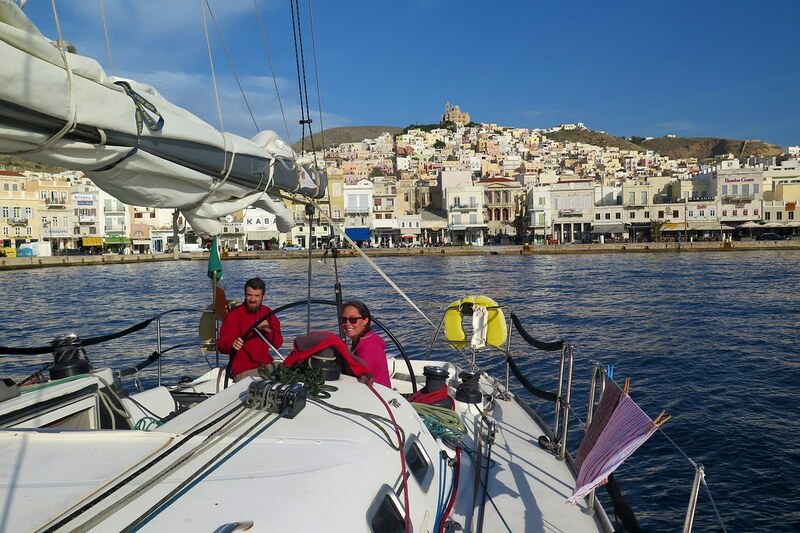 Next stop was Kythnos where we stopped overnight in a few different bays. One of which had a beautiful sandbar where we went ashore for a walk one morning. A dog befriended us and followed us around the hillsides on a fruitless search for a hot spring that was marked on the map. The wind was coming from the south at this point, which brought with it lovely warm temperatures, comfortable enough to be in t-shirts a lot of the time. It definitely felt like spring walking barefoot on the white sand in the sunshine. Around the other side of Kynthos we stopped for another night at Loutra. 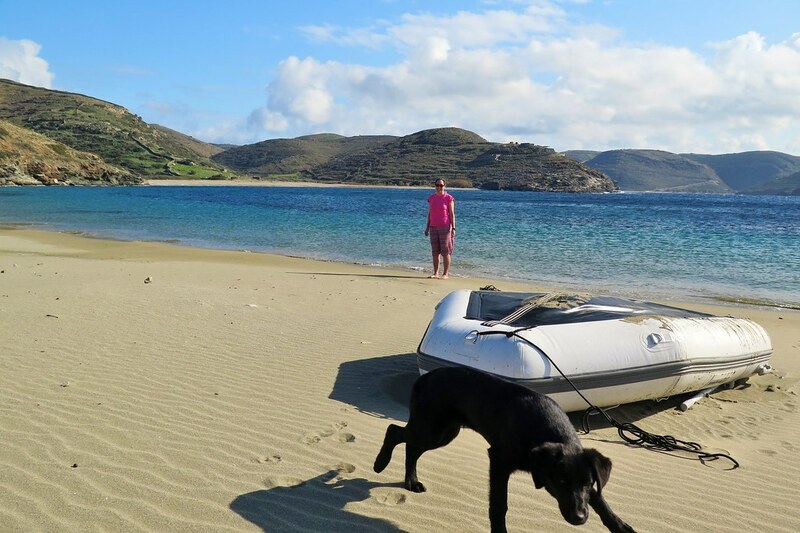 While finding a good spot to drop the anchor, Paddy’s sunglasses fell off his head into the sea. We spent the next hour with Paddy rowing around in circles, me hanging over the edge, my head in the water with a snorkling mask, searching for them. No luck in the end, and a killer ice cream headache. 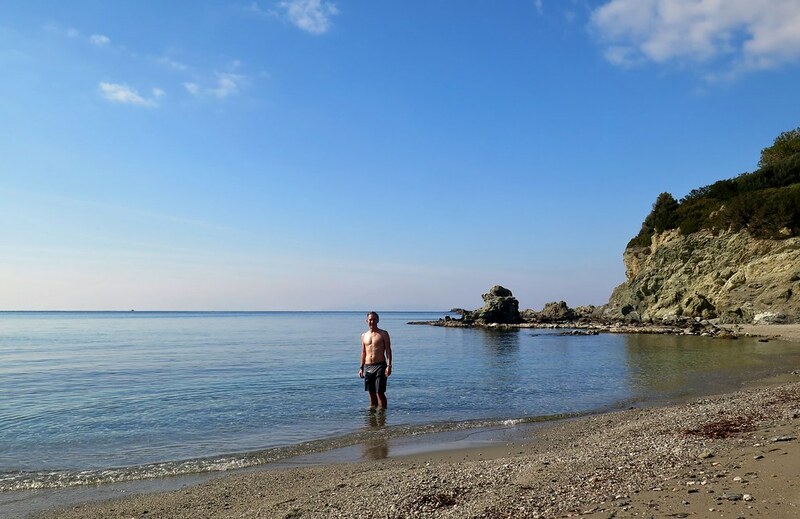 The following morning we found a hot spring, with warm water flowing down into a rockpool on the beach, similar to Japanese onsens. 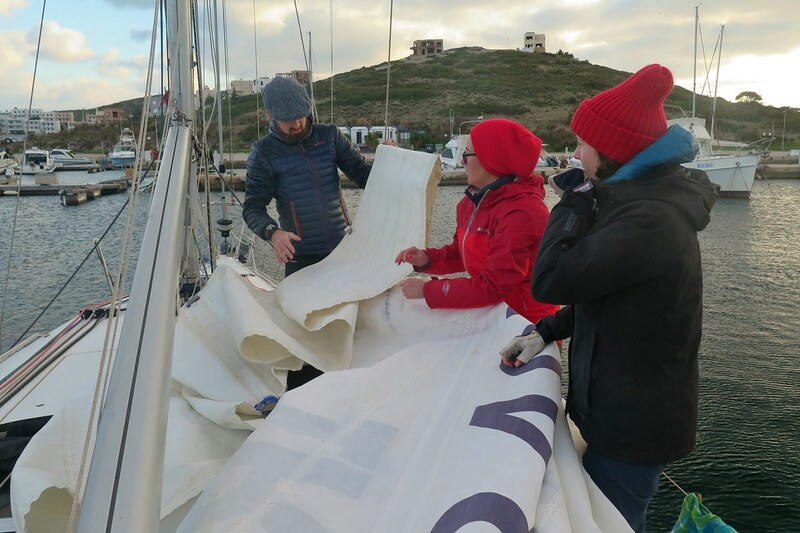 We didn’t get all our kit off as we would in Japan, but we had a good soak and a much needed wash.
We then had a longer sail, in quite strong winds, to get over to Syros. Encore took it all in her stride, picking up some good speed with skipper Paddy (aka Windy-P) getting the most out of the wind. 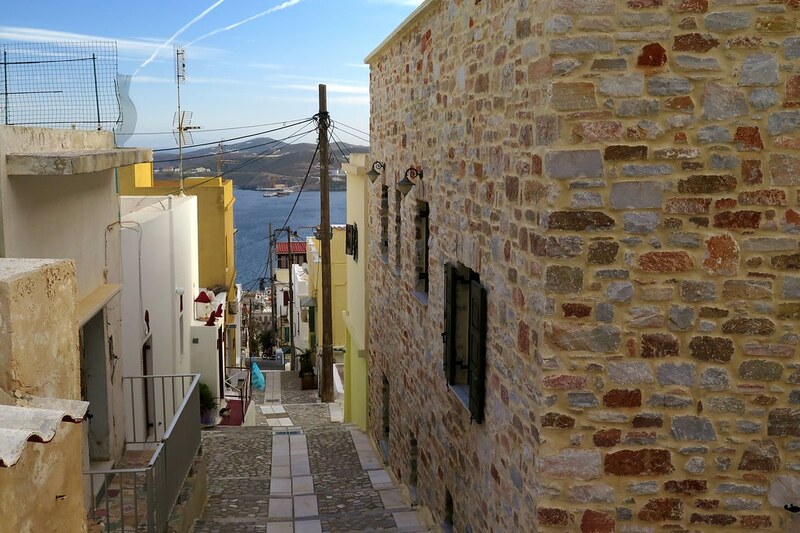 Clare and I were especially happy to get in to Syros as it had become a running joke when we were cycling in the islands, that we (or mostly I) wanted to go there, but the timing of the ferries never worked out. 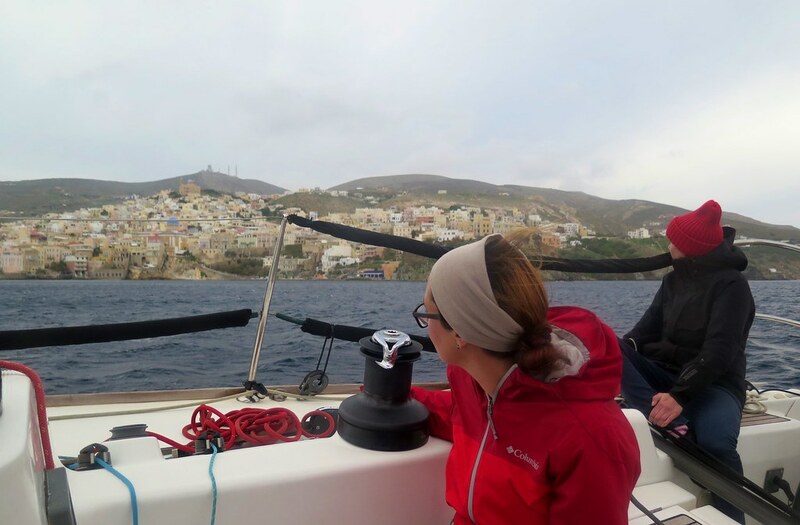 Getting close to Ermopoulis, the main port, the sky was grey and the town didn’t look overly impressive. 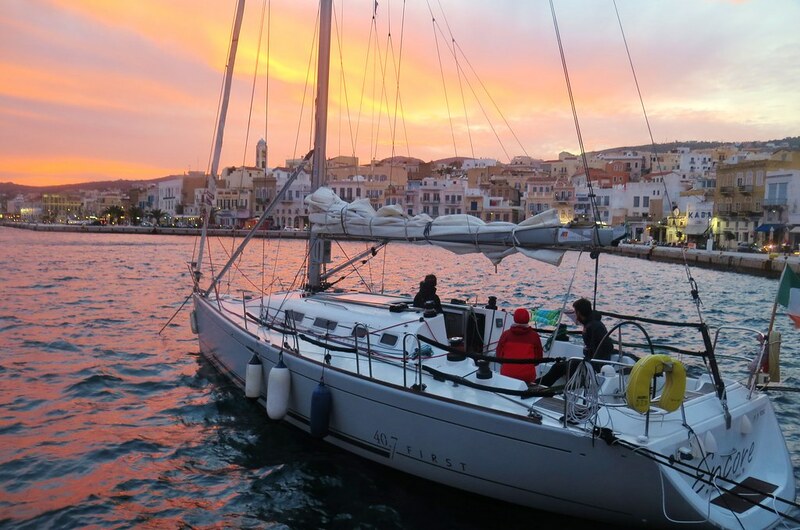 Once we got in and moored up though, we had a beautiful sunset over the old town and we decided to stick around for a couple of days. 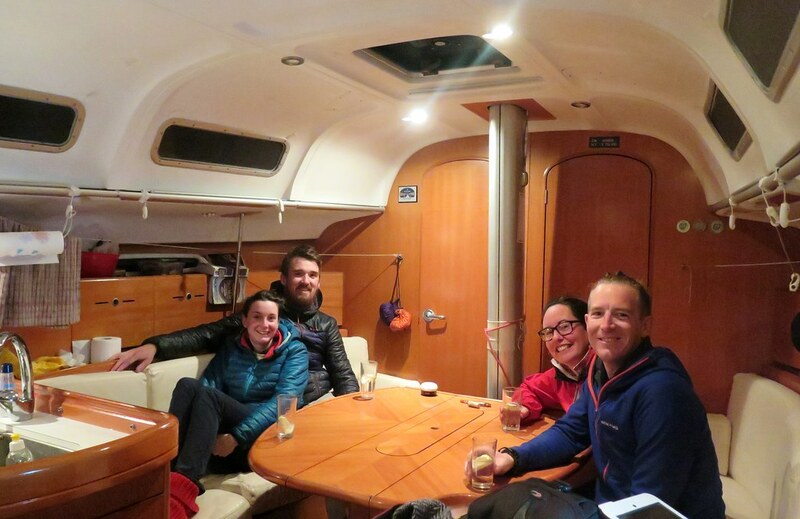 We had a late night on the boat, drinking beer, playing some games and listening to tunes, glad to be the only ones moored in the harbour so we didn’t disturb anyone. The next day we went for a wander around the town, a lovely maze of alleyways and steps running up to an old church on the hill. From the top we had a view down over the harbour and Encore’s lonely mast, and beyond to the shipbuilding yard on the far side. 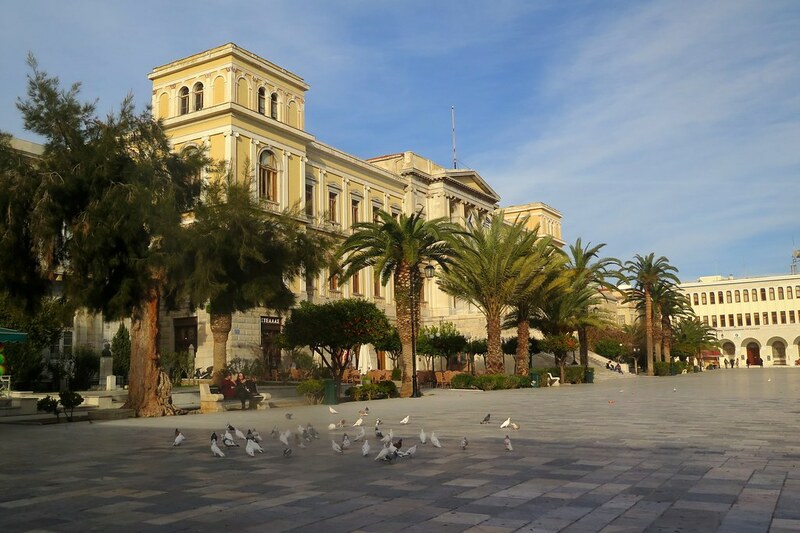 Ermoupolis is the administrative centre of the Cyclades islands, so still felt like a vibrant town even in early February. We were really glad to have finally visited. 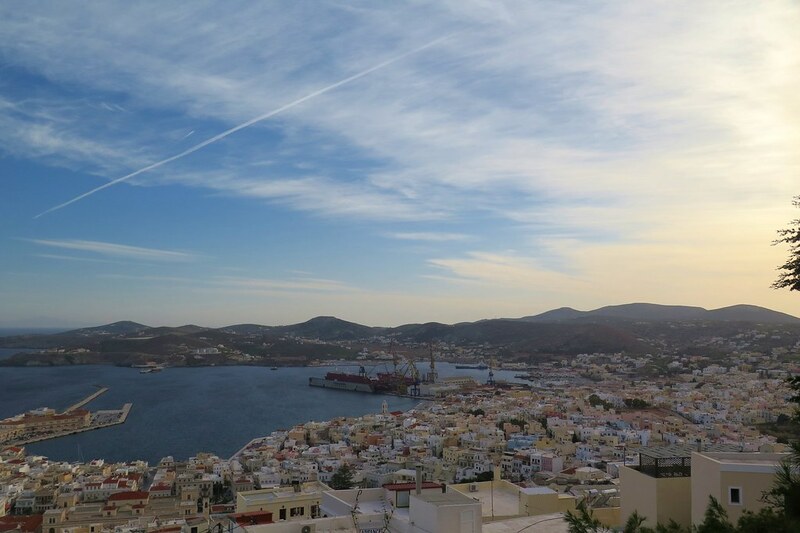 From Syros we started heading back towards the mainland. We split the distance over two days, getting most of the distance done on the first day in beautiful sunshine with the wind behind us. 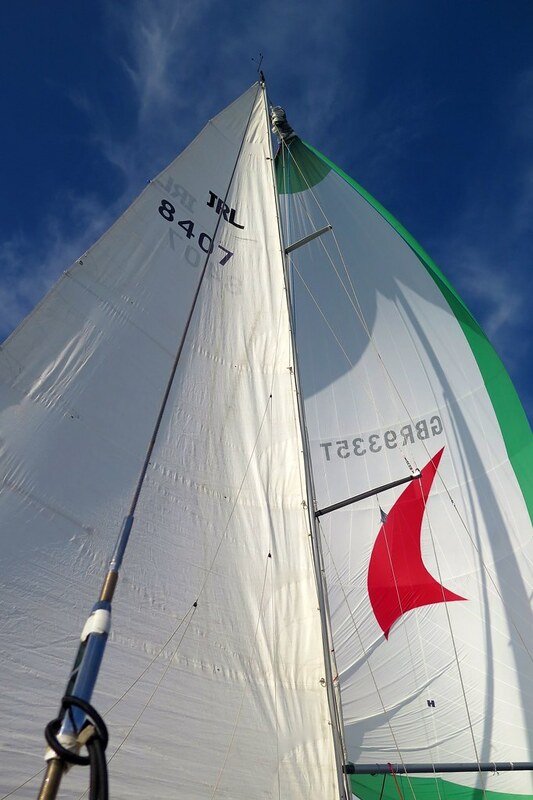 The spinaker came out and we sat on deck in shorts and t-shirts for most of the morning and early afternoon. 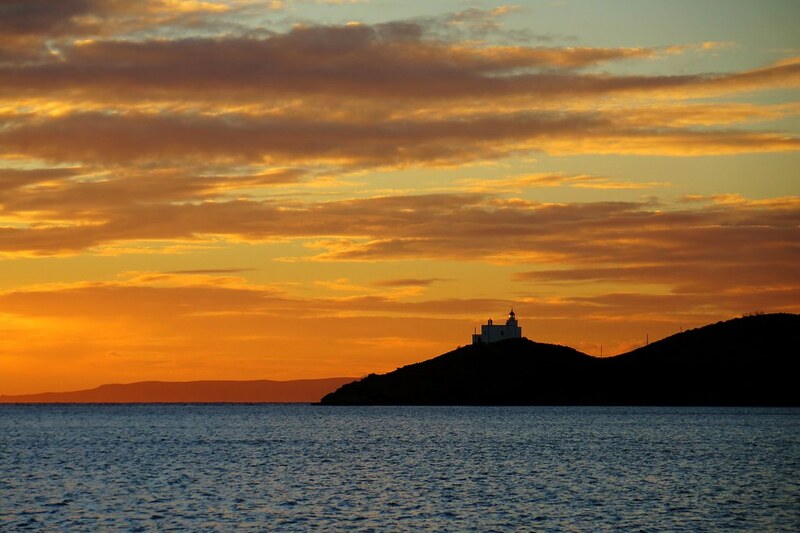 Later in the day we rounded a corner and were bounced around a bit by the waves so we were quite glad to get into a sheltered harbour on the north west tip of Kea where we were treated to another cracking sunset. 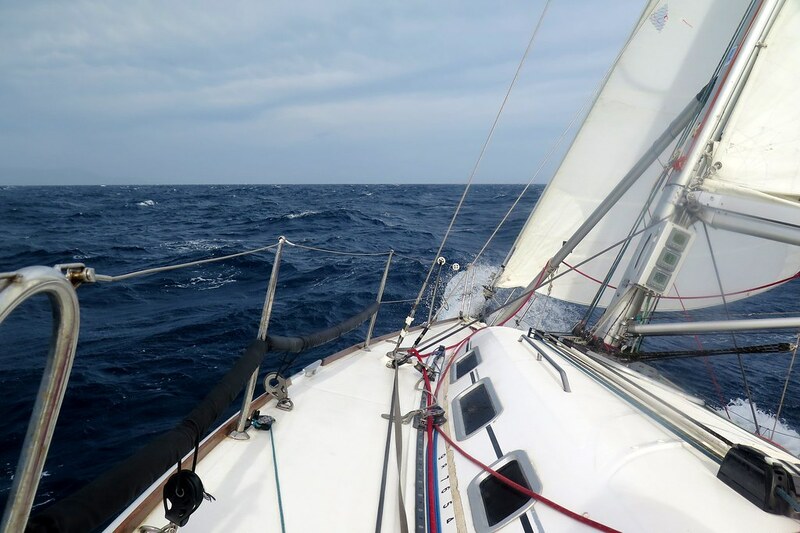 The final stretch back to Lavrio got quite exciting, sailing close to a strong wind and into a rough sea. 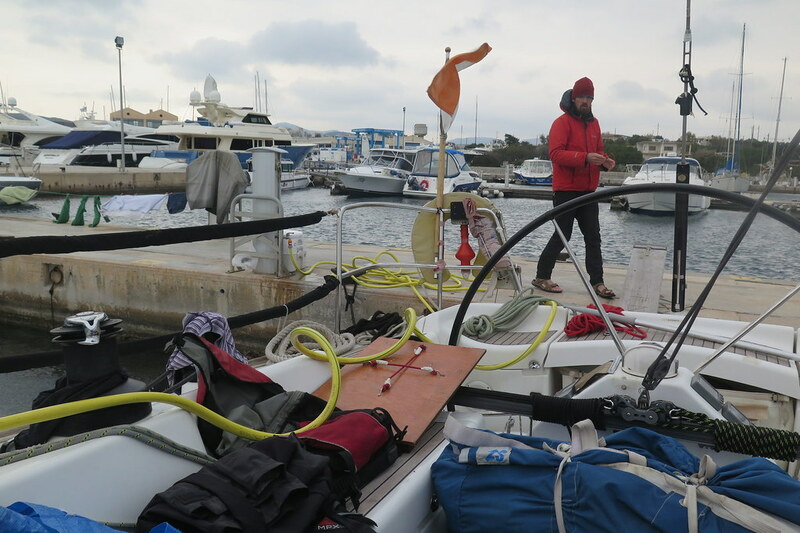 We were in full waterproofs getting regular soakings from waves breaking across the front of the boat. 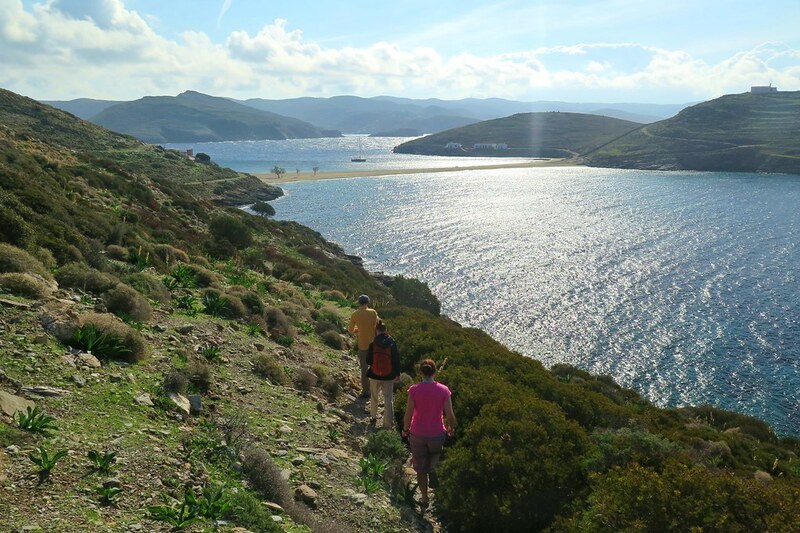 We rounded the northern tip of Makronisos island then turned south for the last couple of miles. Clare spotted another couple of dolphins just as we were taking the sails down getting into the marina, I was the only one not to see them. Again, we were pleased to be back in the calm water of the marina and looking forward to a cold beer. But, Encore had other ideas. 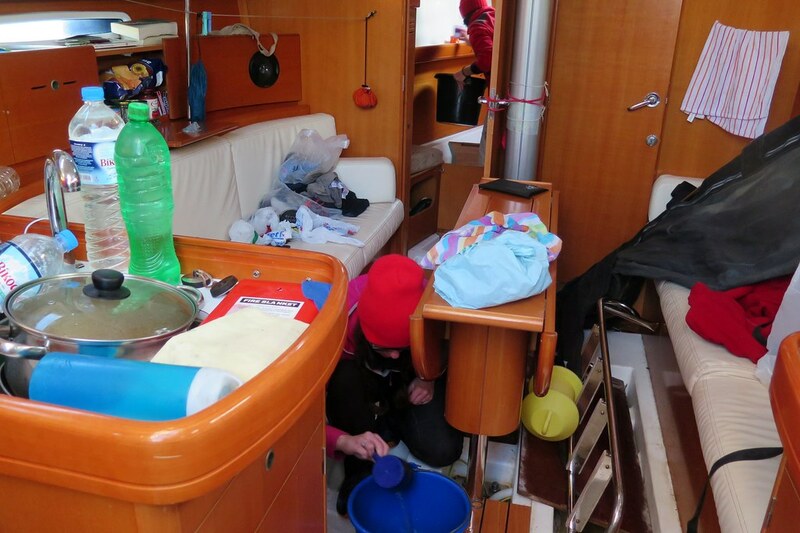 Once we got below deck, the front cabin was completely waterlogged and there was seawater sloshing around under all the floor boards. Unfortunately most of Paddy and Annie’s stuff was wet. We spent the rest of the afternoon bailing out and pulling out soaked clothes and bedding to dry in the sun. Quite a stressful time for Paddy, trying to figure out where the water had come in from. It wasn’t an ideal ending but we had a great time, a perfect side trip to delay travelling north by a couple of weeks. 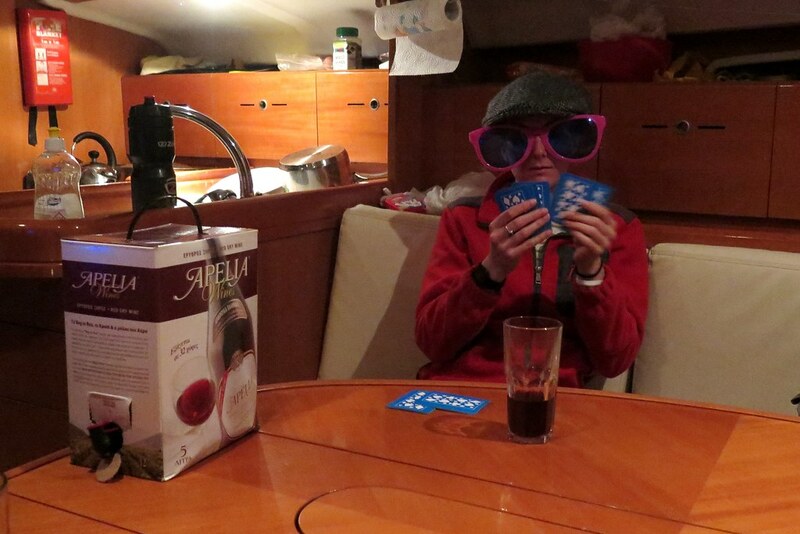 Big thanks to Annie and Paddy for the company, laughs and mad sailing skills. 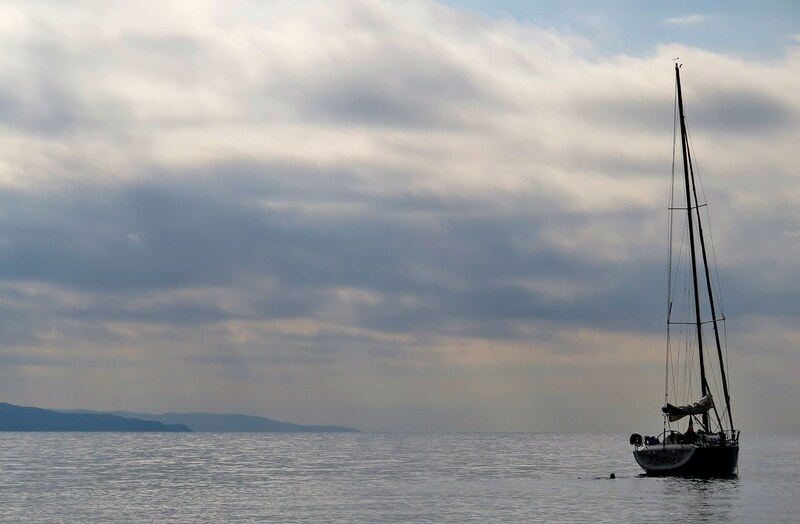 We cycle slowly as you know, so you’ll probably catch us up after your time on the boat. Hopefully we’ll see you soon! I loved this post!!!! 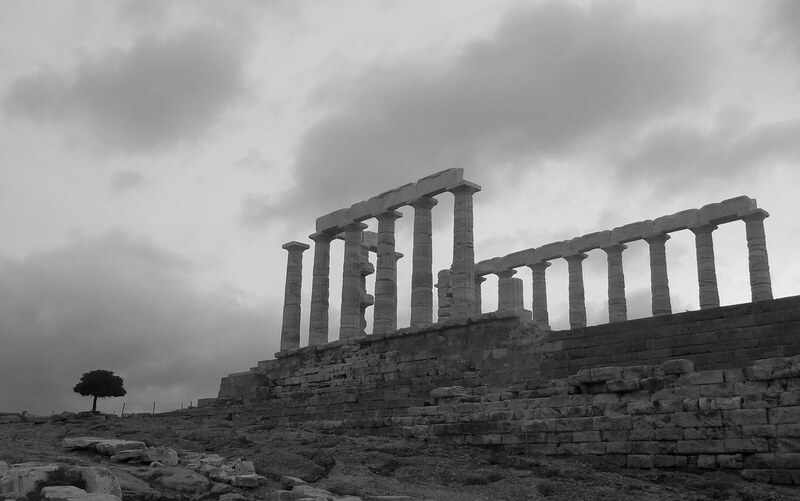 And I also remember one of the most mystic moments of my life: admiring a stupendous sunset at the Sounion Cape (almost) on my own. Thrilling!! Enjoy cycling again guys, you must be happy!